Philadelphia 76ers center Joel Embiid (21) fouls Orlando Magic center Khem Birch (24) during the first half at Amway Center. 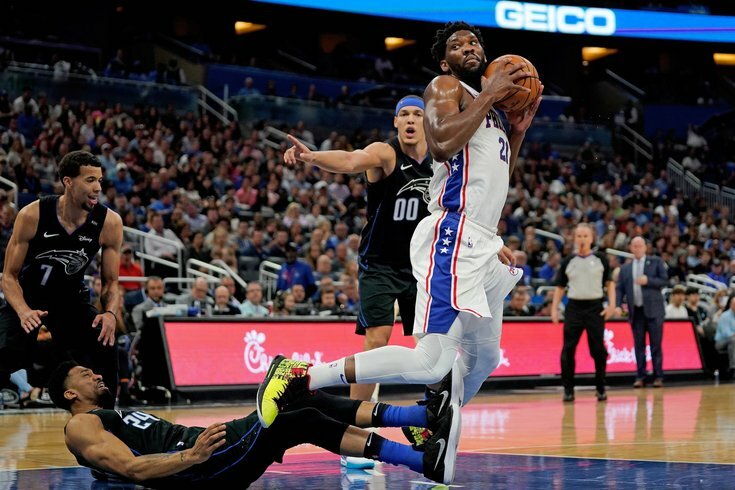 The Sixers got their butts kicked by the Magic on Monday night, 119-98. That's as good a summary as any. Let's get down to what I saw against Orlando. But that should be expected for a young guy. What I liked from Milton on Monday night was how seamlessly he translated his work from the G-League to an NBA floor, and I think there is some real promise there if he gets a chance moving forward. In the first half alone, Milton hit a pull-up jumper in the lane, scored a layup off of a nice backdoor cut, and even hit a nice three coming around a screen at the elbow. He has a lot of offensive versatility, and that's not something you can say about their other guard options. If the defensive concerns weren't quite so glaring this late in the year, I would probably be advocating for the Sixers to convert his deal to a real contract so he could potentially help them in the playoffs. But I suspect we'll see him in short bursts over whatever time he has left on the two-way deal before the end of the season, and perhaps we'll see him get a real chance next season. The Sixers need young, productive players with the core about to get mighty expensive, so every guy they can find helps. Nobody else on the team really deserves to be praised after this game. It's a shame we all had to sit through 40+ minutes of crap to get that moment for the kid, but it was nice to finally see him out and about after a challenging year. • The Sixers probably would not have received a first-round pick back in the deal if they insisted on Terrence Ross instead of Jonathon Simmons in the Markelle Fultz trade. But with the team trying to win this year, doesn't it seem like that should have been a no-brainer? Ross is eons better than Simmons, fits what they need much better, and would have actually contributed to winning games. How they use that first-round pick will impact how we view that trade, but any time Simmons has to hop into the rotation, it's a painful sight. • Philadelphia's turnover problem is never going to go away if Joel Embiid doesn't take personal responsibility for the team having one. He's at the center of a lot of their worst possessions, and since the team isn't exactly going to go away from their franchise player on offense, he has to value the basketball more. Some of the problems are inherent to his style of play. Teams have gone away from post-up bigs in general because it's an inherently high-turnover style, but you will live with the downsides because Embiid is so good and so dominant down there. Fine. If that's the case, you need to execute the other stuff — dribble handoffs, face-up passing, and so forth — at a high level. For all the other things he does well, this is still a glaring flaw in his game. Through a combination of playing more basketball and taking a little extra care, he should be able to fix it. • This feels like I've written about it for 15 consecutive games, but I do not think Boban Marjanovic is a real option when the games matter. Brett Brown has said the team is committed to seeing if it can work playing Boban as their primary backup to Embiid. I think we have more than enough evidence to suggest they should begin preparing a Plan B.
Nikola Vucevic is no slouch, but he's worse than the sort of guys Boban would be up against in the playoffs. He has no chance against guys like Brook Lopez, Al Horford, or Marc Gasol, who will force him to defend out to the three-point line and leave him hung out to dry if he takes even one wrong step. The rim protection you're ostensibly leaving him on the floor to provide is not really able to show up if teams are just dragging him where they want on the court at will. I don't think Jonah Bolden is a great option either — we've seen him look like a complete space cadet more often than not, with teammates yelling at him routinely for blowing a play. But he at least has a chance to prove he can become that guy behind Embiid. Boban has long since shown that he's not up to the task of defending the most important spot in a defense. I don't know what Brown is trying to prove here. • Keeping everything I said above about Milton in mind, I do think there's an argument that the team owes it to the rest of the group to see if someone, anyone can give them better minutes than McConnell has over the last month and a half. He got soundly outplayed by Michael Carter-Williams, who may once have seemed like a promising young talent but nowadays is near the end of his NBA rope. When you need an injection of energy, I think McConnell is always going to be there to give it to you. But that's a situational play, and he has been a fixture in the rotation for far too long to be this ineffective. To make matters worse, he does little things that hurt the team that are about nothing more than his own selfishness — he has passed up more shots at the end of quarters than anyone else on the team, easily, and letting the clock expire to protect his field-goal percentage does nothing except hurt the team. • After the game against Atlanta, I was content to call it a letdown game and point to Philadelphia's recent success as something to hold onto. It's a long season, it was the end of an emotional week for the team, these things happen. To follow up that effort in Atlanta with this game in Orlando? That's simply unacceptable. The Sixers were down Ben Simmons and the Magic have more to play for with their season on the line, but the Sixers have three freaking stars — or at least two, if you don't consider Harris at that level — and that should be more than enough to beat Orlando on the road. I really don't care how new the group is, I don't care how bad the bench is, getting shellacked by that group should embarrass them. It boggles my mind how often this team gets beat on pure effort plays. The Sixers have a lot of good rebounders on this team, and they just let guys like Carter-Williams beat them to the ball. It wasn't technique, it was all effort. That is the sort of thing that you shame a team for, from Embiid down through the 15th guy on the bench. • Philadelphia's defense has not been as good as it has needed to be pretty much all year. They've been slightly above average for most of the season, but I think that is mostly about having Embiid on the roster. The talent elsewhere is not great, the communication isn't spectacular, and the effort comes and goes. They've been beating teams with individual offensive talent for a lot of the second half of this season. So when the offense fell apart in the second half, with the Sixers going on an extended drought between the third and fourth quarters, it felt like they got exactly what they deserved for not investing enough care on the other end of the floor. Orlando torched them, and that was the ballgame. Yes, this is the worst part of the NBA calendar, and they will almost certainly not look this bad when the games matter. But this is a team that needs to be building toward something. They've proven nothing. They have zero collective playoff pedigree. Butler has won nothing. Embiid has won nothing. Harris has won nothing. Simmons has won nothing. When they make some deep playoff runs and know they need to rest their legs for the long haul, maybe they can get away with this. But these guys aren't the freaking Warriors, who have won multiple titles and have earned their right to take the regular season less seriously. Nobody is going to crown them champs because they beat the Celtics and Bucks in March. They should stop acting like that's the case. • When Ben Simmons is unable to go, it really underlines just how limited Philadelphia's guard options are. They desperately need to upgrade there this summer.